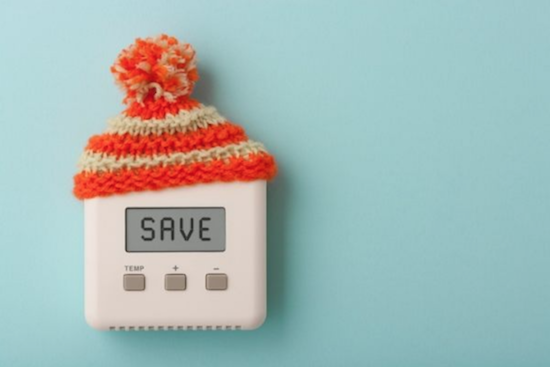 Although it's a foreign concept in warmer climates, a good chunk of the country needs to concern itself with inflated utility bills during the winter months. The good news? Your showers can be warm, but they shouldn't be scalding. Manually reducing your water heater's temperature to 120 degrees Fahrenheit (down from the typical 140) can save you up to 11% in water heating costs; cutting showers in half can save up to 33%, according to the California Energy Commission. Changing furnace filters isn't just about clean air: Clogged material can force your unit to work harder, raising energy costs. Replace the filter and opt for a furnace inspection by a professional to make sure it's operating at optimal efficiency. Peeling weather-stripping and ill-fitting doors and windows can let in drafts, allowing your home's heat to drift outdoors. Replace weatherstripping as needed and adjust thresholds so no cold air is getting in through gaps. You can also use plastic window kits to help insulate from leaks. You'd be surprised at how comfortable you can be with your furnace set at 68 degrees as opposed to 70 or 71. While it might mean opting for long sleeves over a t-shirt, you'll save roughly 5% on room heating costs. Got a guest room you rarely use? Close the vent coming from the furnace. Rooms that don't need to be heated can be sealed off so the heat gets redirected to occupied parts of the home. They're not just there to keep you cool in the summer. Keeping a fan running clockwise will push the warm air that's collected near the ceiling back into the room. Attics should have a minimum of 11 inches of fiberglass insulation. Without it, you're going to lose heat through the upper level of the home. If you haven't put down insulation, be sure to seal up any cracks in the attic floor first. After taking a hot shower, don't be so quick to reach for the exhaust fan switch. The humid air from the steam will likely migrate to neighboring areas, warming the air in the process. Sunlight is a free way to warm up a room, providing you've opened drapes and blinds to let it do its thing. When the sun sets, close the drapes to help retain the heat collected during the day. With low energy use, electric blankets can allow you to dial down your thermostat even more during the evening. Lighting a candle will result in a tiny smoke trail: if you see it being tugged in one direction of the room near doors or windows, you likely have an air leak that can be treated with caulk or another sealant. Be sure to blow out your candle before you exit the room, however—it's never a good idea to leave an open flame unattended.